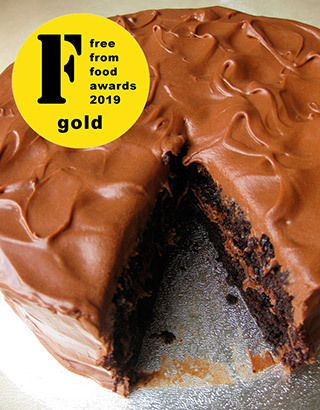 I love this luscious chocolate cake – and so did the judges at this year's FreeFrom Food Awards – they gave it a Gold award! 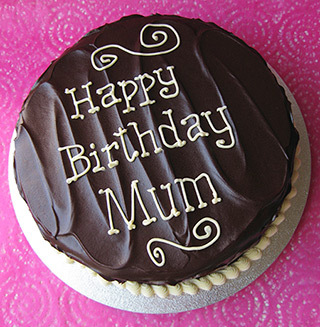 It's a divinely soft, moist sponge, made with Fairtrade organic cocoa powder and gluten-free flours. Filled and frosted with a vegan 'cream cheese' chocolate frosting made with organic dark chocolate and a spoonful of strong coffee: utterly irresistible! All ingredients egg free, gluten free, dairy free, and free from any animal ingredients. For a special celebration, I can frost this cake with a vegan dark chocolate ganache, made with organic dark chocolate (left). Then I can add your piped message on top. 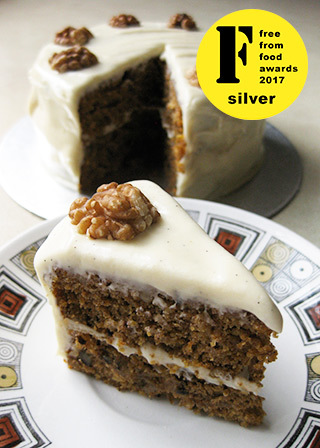 Awarded Silver at the FreeFrom Food Awards 2017, this luscious vegan cake is made with organic carrot and coconut, crushed pineapple and chopped walnuts, and spiced with cinnamon, Jamaica allspice, ginger and Madagascar vanilla seeds. 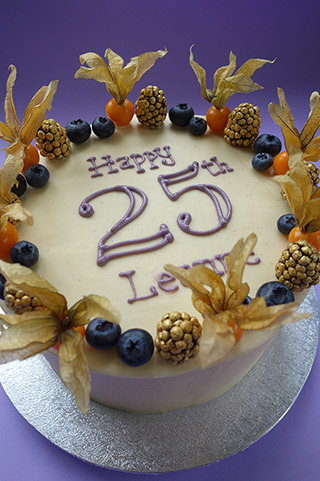 With creamy soya/vanilla seed frosting. 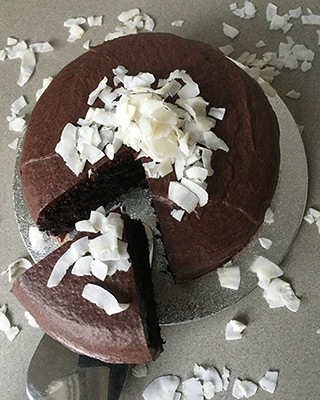 "dairy-free and egg-free, as well as gluten-free – perfection. 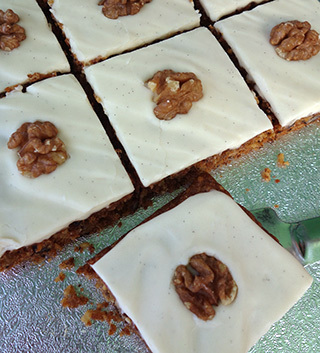 Quite heavy on the walnuts" (as it should be!) 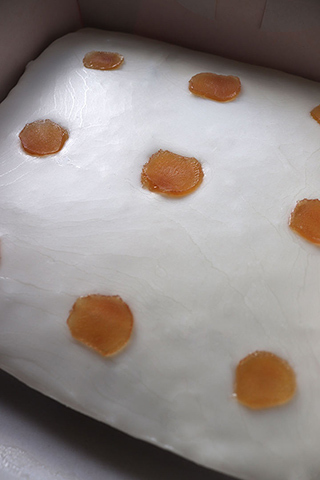 "... the cake itself is moist with a good balance of sweetness". Made with egg free, gluten free and dairy free ingredients, no animal products. For a special celebration, I can dress this cake up for you (left). Various toppings available. Ever had a peanut butter and banana sandwich? Such a fabulous flavour combo! 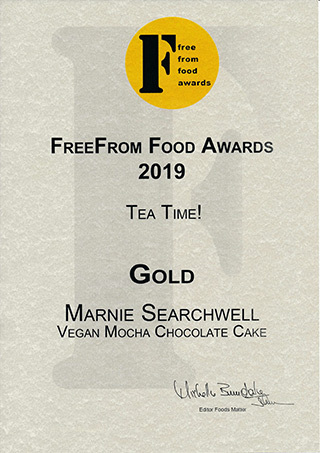 My vegan blondies are made with organic bananas, fragrant Madagascar vanilla and rapeseed oil, and a special gluten-free flour blend that includes peanut flour. 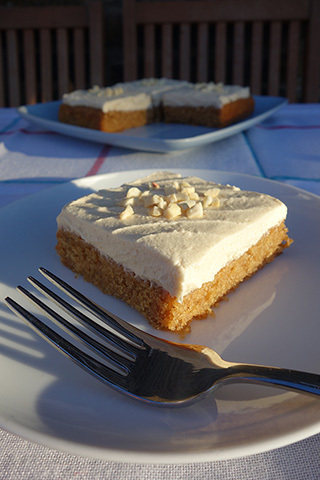 Topped with a luscious dairy-free peanut butter vanilla topping and crushed, roasted peanuts. 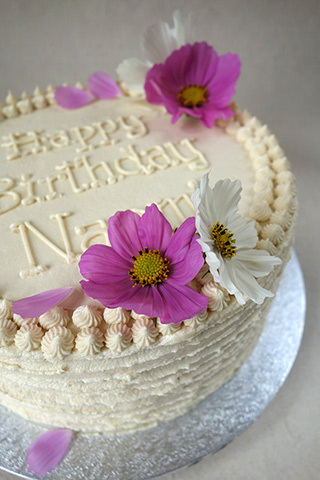 For a celebration, I can dress this cake up for you with organic edible flowers (left, below) or other decorations. 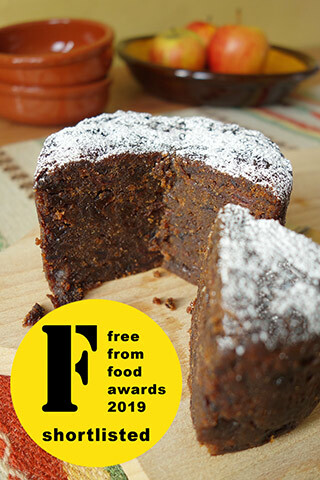 Shortlisted for the 2019 FreeFrom Food Awards, this moist, dark fruit cake is made with the finest organic ingredients: raisins, sultanas & Bramley apples, cranberries, apricots, prunes, orange & lemon zests and cold-pressed virgin coconut oil, all steamed in apple juice. Contains ground almonds, and Appleton Jamaica Rum. Lightly sweetened with organic dates, no added sugar. All ingredients gluten-free, dairy-free, egg-free, no animal ingredients. If you prefer, I can make this cake for you without rum. Comes with a sachet of organic, unrefined cane icing sugar to dust before serving. 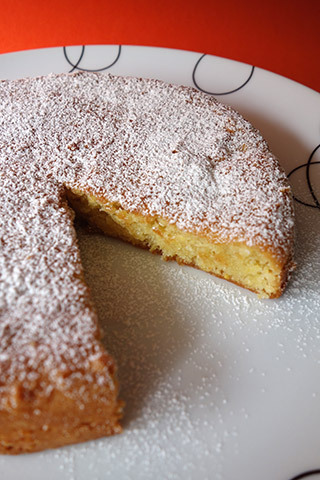 This fragrant, moist cake is made with organic oranges & ground almonds, dairy-free yoghurt and organic extra-virgin olive oil. Flavoured with almond and Madagascar vanilla extracts. Comes with a sachet of organic, unrefined cane icing sugar to sprinkle on top of the cake before serving. This classic ginger cake is dark and sticky, sweetened with dark muscovado sugar, organic blackstrap molasses and golden syrup and spiced with freshly grated root ginger, Jamaican allspice and cinnamon – just like they make it in Jamaica. Made with egg-free, gluten-free, dairy-free, nut-free ingredients, this cake keeps very well, becoming more sticky and luscious. It's at its best about a week after baking. If you have a favourite flavour you really fancy, please get in touch. Many of my recipes can be adapted to suit vegan diets. So just telephone 020 7735 1444 or click here to submit enquiry. Then we can talk about what you need.